The village of Helensburgh originally developed between the school and the railway. The first shops were the Post Office store down from the school and two shops opposite the Norm O’Brien park: a small store carrying groceries and vegetables, now the home of Bruce and Lee King, and a butchery. 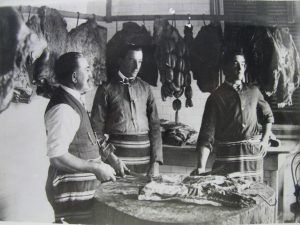 The butchery was established by George Luck, taken over by his son Alf Luck, and then his son Ken Luck. Tex Griffith was the last employee to work in the shop. As the town moved up to the plateau, George established a second butchery opposite the Centennial pub. He also established another butchery opposite the Clifton Hotel. As well as the shops, he set up a delivery service to the outlying areas. Pack horses with saddle baskets were used to take meat down to Otford, Stanwell Park and through to Clifton. Some of the meat came from the Helensburgh slaughter yard, the rest from the abattoirs by rail. Alf later replaced his horses, the last named Daisy, with a Dodge van, the first van in town. How did they keep the meat without refrigeration? Young boys were employed to beat the flies away with a branch of Eucalyptus leaves, simple! Another “bottom end” shop was established early last century. This was the Co-Op Store at the corner of Postman’s Track and The Crescent. In later years there was Mrs Coffee’s shop in Postman’s Track and Mrs Bowyer’s shop (The North Helensburgh Post Office Store) on the corner of Parkes and Foster Streets. There are now no shops in what is affectionately known as “Struggle Town” (it’s a struggle to get up to the shops at the top end of town), but a regular bus service operates to the shopping centre, and the train service operates to the Engadine and Sutherland shopping centres. © 2019 Helensburgh and District Historical Society. All rights reserved.